The third season of Vikings is set to premiere tonight in the United States and Canada. 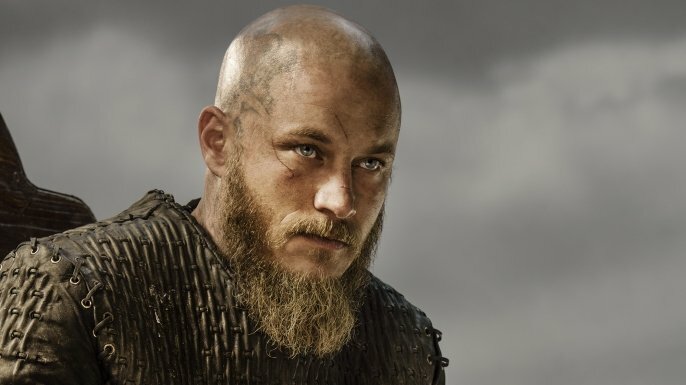 The show, which follows the adventures of Ragnar Lodbrok and his family, has been averaging over three million viewers in North America. How much of the writing is based on actual historical stories rather than being pure fiction? How do you make the historical parts fit in with the story you’re telling? The story I’m telling comes out of my historical research. I don’t have a fictional story that I just add historical details to. Everything I do starts in research, and reading. And during the research / reading, storylines and characters start to emerge. And although I can take these characters for a walk, I never leave their historical reality behind. It’s like putting down an anchor from a ship – you could sail the ship away from an anchor to an adventure, but you are still anchored to the reality, or what you know of the reality. So for me, that’s the dichotomy between fiction and history. It’s something I am very proud of, that VIKINGS is as real as we can make it – I don’t like fantasy myself, because fantasy can be very, very entertaining, but it’s ultimately meaningless because it doesn’t hold a mirror up to us the way that history does. Whereas a show like VIKINGS can get people interested in Viking culture, and if they are interested in Viking culture, they can go read history books, check out the facts, see what is real or perhaps what I might have pushed too far. But it’s a real show about real people and real events, and it’s also done in a real way, and that is something else that I am proud of. Mr. Hirst, How does the research process work for your show? Obviously you are passionate about the subject matter…but is there a team that goes about fact-checking, finding legends, and seeing what really happen to find what would make great TV? Yes. I work with two people, one of whom I’ve worked with for many years, and that’s a historian called Justin Pollard. Justin is an expert in the Dark Ages, and will check through everything that I write to make sure that it’s plausible and real. We’re not making a documentary – so you can’t ask for everything to be accurate. After all, this is the “Dark Ages” and there is very much we don’t know. But I have to say this: I had a radio interview, with the head of Scandinavian Studies at Harvard University, who is a Swedish professor. And we showed him the first 3 episodes of the first season, before they were broadcast, and I thought he was going to eat me alive… but what he said was “this is the first time my culture has ever been taken seriously, and treated intelligently.” I believe that a Canadian network has done some small documentary films to accompany the show this season, and they went to Scandinavia to ask academics and interested people how authentic they thought the show was. And they said “We had academics begging and pleading to be part of this programme. They love it in Scandinavia!” and that is fantastic, as far as I’m concerned. The other person that I – I don’t work with him, but he surprised me with story-lines from Norse Sagas – is an Icelandic novelist, Ólafur Gunnarsson, and I am very grateful to thank him for the authentic insights on the mythic side of Scandinavian and Viking life. Ehm… oh I have lots of favourite scenes. I think one of the most powerful was the blood-eagling in Season 2. I knew, when I wrote this, that it was a controversial scene and would be difficult to shoot, and it was challenging to shoot because it’s very extreme, but I wanted to write it and wanted to shoot it because it takes us deeper into the heart of the Viking experience and the Viking beliefs and Viking society. So that was an important scene. First, as a woman, I want to thank you for portraying excelent strong female characters on a tv show. We just love and worship badass Lagertha and clever Siggy and are starting to like motherly Aslaug. Will we continue to see this strong characters in season 3? Will they change? Will we have more female strong characters? Well, thank you very much! Yes, those 3 female characters – Siggy and Aslaug and Lagertha – are essential parts of season 3. And they are all strong women, in their own way. I think things happen to Aslaug that will probably increase interest in her. There’s an unexpected side to her that will be revealed. And there are going to be some NEW strong women coming from an unexpected place, which is Paris, as you know (it’s no secret) the Vikings are attacking Paris, so we are going to spend some time with the Frank side of defenders. And there are a couple of strong female characters who will emerge from that side of the conflict. But i like writing female characters. I did my thesis at Oxford on the stories of Henry James, and Henry James always said that he preferred to write female characters! So I’m glad that people respond to this. I of course wrote ELIZABETH – that was one of my favourite things I ever did – and maybe it’s something I can’t entirely explain, I do have a lot of daughters, that may have something to do with it, but somehow I just find women characters just more complex, more unexpected. How big of a risk was to put a show together with bad guys as the main characters? That’s a very good question! Many people told me that it was impossible to write a show about the Vikings precisely because Vikings have always been seen as the “other.” As “bad guys,” the guys who break down your door in the middle of the night and plunder and raid – so how are you ever going to make them the interesting guys, the guys you were rooting for? Well, there were 2 answers to that. One is the reputation of Vikings had nothing to do with them, because they never wrote anything down. They were non-literate. Their actions were mostly written down by their enemies, the Christian Monks, who had every reason to diss – not only their behavior, but their pagan beliefs. It was their paganism that really frightened the Christian Monks. So there is a lot of propaganda about the Vikings, and I became aware, during my research, that there were many more things to say about Vikings and Viking Culture – not in the least their technological abilities to build these extraordinary boats, which could cross open oceans and sail up rivers, their democratic habits as a society (they were much more democratic than the Franks, or the Saxons – people were elevated largely on merit), and they had some very good laws – when they finally occupied large areas of the center of England, that was called the “Dane Law” because they imposed their own laws, some of which continued to this day. So I had another agenda – I wanted to open a dialogue about an unexpected group of people. It’s funny that, with many of these questions, it’s clear that people can’t quite believe I write the show myself? Well, I think there’s such disbelief in the States, that there’s a lot of people churning out material, and it’s a collective thing? But I have a very academic background. I went to 3 universities, including Oxford. I thought I was going to be an Academic, until I happened to meet a film-maker who read some of my short stories, and wanted me to write a script. So I sort’ve stumbled into my career. And as I said, I have a historical consultant who has many degrees, is extremely bright, and you know, every department at the studio – the costumes, or the production design – all those departments themselves will do a great deal of research, and work on the period, and the details, and it’s fantastically creative and exciting, finding out what people have found out, and what we are doing. And here’s a very important thing: if you include Latin as a dead language, we have FOUR dead languages in the show. We have people speaking Anglo-Saxon, Old Norse, Old French (when they raid Paris, which sounds more like German than French, actually) and Latin, and can you tell me ANY other network show that has people speaking four dead languages in it? No! I mean, they don’t speak it much, but you can tell that is what they are speaking. I wanted people to hear what those languages really sounded like. It’s a very important part of the authenticity of the show. And of course there was INTENSE excitement in the Academic community when they were asked to translate some dialogue into Old Norse, or Anglo-Saxon, because these languages haven’t been spoken or heard for Hundreds of years? So there were academics at Cambridge, who were not only asked how to give us the words, but how to pronounce them. And it’s part of the living texture of the show, that people don’t just dress up like the period, they speak like the period. And that is wonderful. I think it’s utterly fantastic. You can read the entire Q&A with Michael Hirst on Reddit.